If you have a new baby clothing collection on the way you have to try Placeit's photorealistic visuals! Just choose the ones you like and customize a unique set to spread them all over your social media pages. Try this one featuring a cute baby girl holding her mom's hand in her bedroom. Sweet, right? Improve your POD brand with Placeit's onesie mockups today! 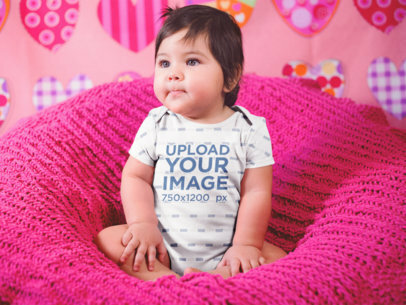 Create sweet and modern visuals for your baby clothing line with Placeit! Try this onesie baby mockup of a little girl by her rag doll, the cutest way to showcase your clothing designs to your customers. In just a few minutes you can customize your favorite visuals and display them all over your social media pages and POD brand. No time to waste! Choose the onesie mockup that fits your needs and improve your sales today. 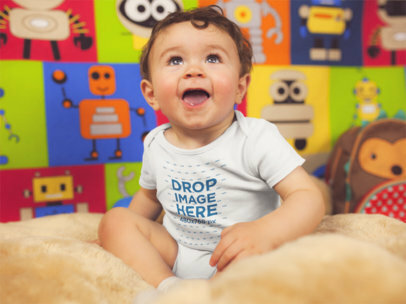 Put your onesies design into breathtaking visuals and boost your sales today! With Placeit's onesie mockups, you can customize your favorite ones in just a few minutes and spread them all over your social media pages and POD websites. It's so easy and fun! Would you like to try it? Check out this mockup featuring a baby girl holding onto her crib and promote your brand right away. 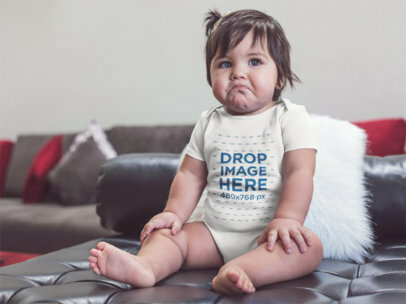 Use this onesie mockup from Placeit to promote your new line in baby clothing. With Placeit's onesies mockups, you can transform an already cute picture into a great promotional picture for your original garment. Create amazing visuals and boost your brand's image with Placeit. Launch your baby clothing line with eye-catching visuals just like professional brands do! With Placeit's photorealistic mockups, you can customize your own in no time. Try this onesie mockup featuring a baby girl inside her crib, the perfect way to showcase your clothing designs in a modern and elegant way. What are you waiting for? Choose your favorite onesie mockup and improve your POD brand right away! Put your baby clothing line designs in outstanding visuals and boost your brand's growth today! Placeit's onesie mockups will help you promote your garments everywhere online. Try this onesie mockup featuring a baby girl in her crib. Are you ready? Customize your favorite onesie mockup by Placeit and improve your POD websites today. Looking for ideas to promote your baby apparel brand? Placeit's photorealistic mockups are just what you've been searching for. This onesie mockup features a cute little baby girl in a crib and with just a few clicks, she will be wearing your original design. You don't even need any photo editing knowledge. Try Placeit now! Promote your new baby clothing line in a cute and professional way! With Placeit's photorealistic visuals, you can customize your favorite mockup in a matter of minutes. What about this onesie mockup of a smiling baby playing with his stuffed animal? It's exactly what you need to boost your brand's growth online. Try any of Placeit's onesie mockups and improve your marketing strategy right away. Promote your brand online with Placeit's easy-to-use mockups! If you have a new baby clothing line on the way, this onesie mockup of a smiling baby boy being lifted by his mom will melt your customers' heart and boost your sales in no time. What are you waiting for? Try customizing your favorite onesie mockup and improve your marketing strategy with the help of Placeit. Check out this cute baby wearing a onesie! New Moms and Parents will be captivated by your beautiful designs and your sales will increase! It's amazing, all you have to do is customize the settings to your style and even change the onesie's color! 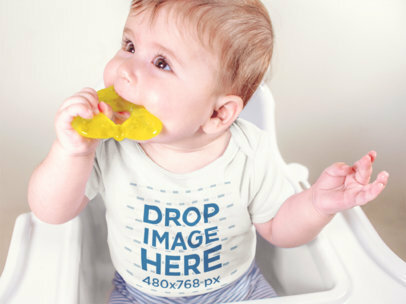 Try it out, you onesie design will shine with Placeit's adorable mockups. Looking for professional visuals to promote your baby clothing line? 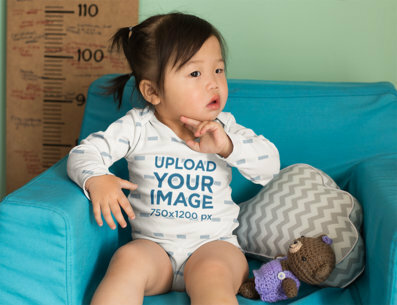 Placeit offers you tons of onesies mockups, just like this one featuring a cute Asian baby girl sitting by her crib. Want to try it? Choose your favorite Placeit onesie mockup and improve your POD websites right away! What if you could showcase how your baby clothing line in attractive and professional visuals? 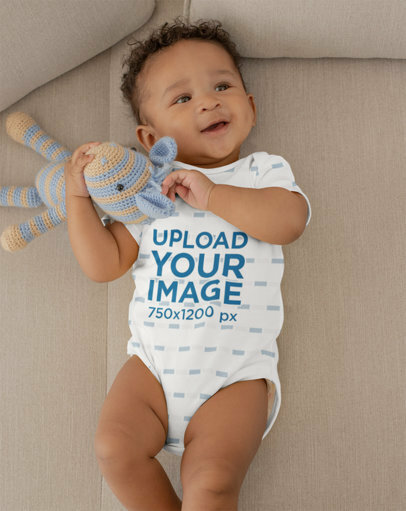 With Placeit's smart mockups you can now customize your favorite onesie mockup in a matter of minutes! Try this one featuring a smiling baby boy on his bed surrounded by stuffed animals. A really elegant and sweet way to promote your designs online. It's your turn! Choose the onesie mockup that fit your needs, and improve your marketing strategy today. Boost your new baby clothing line in a cute and professional way! With Placeit's photorealistic visuals, start customizing your favorite mockup in a few minutes. 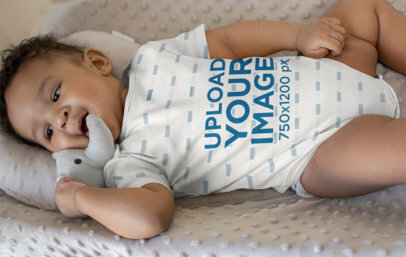 Try this onesie mockup of a smiling baby playing with his stuffed animal, it's exactly what you need to promote your designs in a professional way. Choose your favorite onesie mockup and improve your marketing strategy right away. 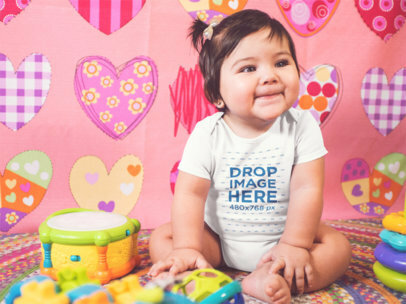 Start creating professional-looking visuals for your baby clothing line and promoting them through your social media pages! With Placeit's easy-to-use mockups, you can boost your sales in no time. Just like this onesie mockup featuring a baby with cute dimples lying next to his stuffed animals. Sweet, right? Try customizing your favorite onesie mockup and promote your brand the right way today! Got a new baby clothing line on the way? Promote it in a professional way with Placeit's photorealistic visuals! 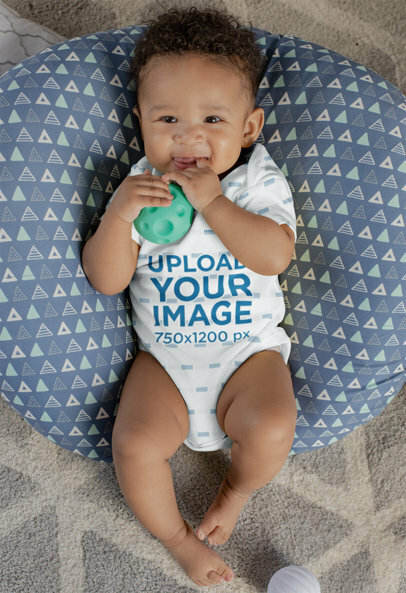 Just customize your favorite onesie mockup, like this one featuring a cute baby boy over a soft cushion, the sweetest way to boost your brand online. What are you waiting for? Choose between Placeit's different onesie mockups and improve your marketing strategy right away! Do you have a baby apparel brand and looking to promote it online? 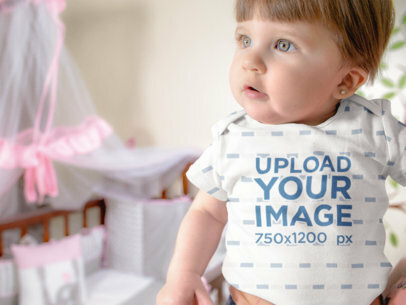 Try Placeit's onesie mockups, a photorealistic way to show everyone how your original designs look in real baby models. You don't need photo editing software, just upload your image and place it on the mockup. Cool, right? 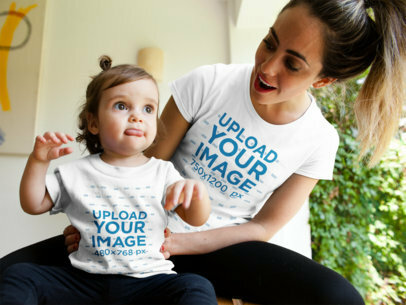 Check out this awesome mockup featuring a mom and her baby girl wearing t-shirts making faces at each other, it's a gorgeous and really beautiful mockup that you can use to promote your latest designs to your audience in a visually appealing and photorealistic way. Take a look at this gorgeous baby girl wearing a onesie while standing in mommy's arms, isn't she cute? 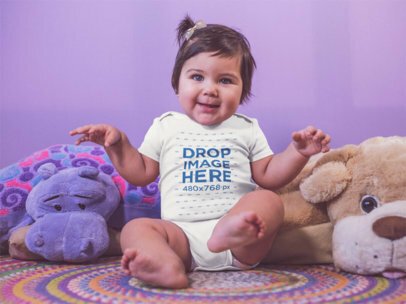 Showcase your audience how your onesie design will look like on this little princess, it's super easy to do and doesn't require any additional software. Try it out, it's awesome! 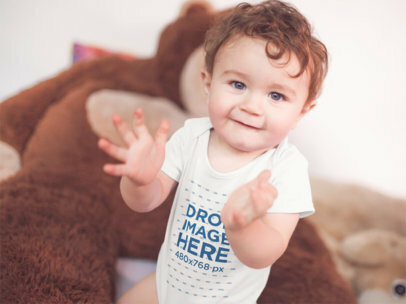 Check out this mockup of a happy white baby boy clapping while sitting down and wearing a onesie! Placeit is all you need to promote your brand in a really engaging way. Just drag-and-drop your image design on the interface, we will process it in just seconds for you! You won't even have to open Photoshop. Amazing, right? Try another Onesie Mockup here! This mockup of a little baby girl sitting down while smiling and wearing a onesie near her teddy is a great option for you to promote your latest baby designs! All you need to do is drag-and-drop your image design on this interface, Placeit will merge it in just seconds! Amazing, right? Start using professional and beautiful images now, and see how your revenue starts increasing. Start now! Try another Onesie Mockup here! Take a look at this beautiful little baby sitting on a pink sofa while wearing a onesie. It's a gorgeous template for you to promote the cutest designs in a realistic way! Just drag-and-drop your image design over the interface, we will merge it with her piece of clothing in just seconds! Try another Onesie Mockup here! For best results, we recommend uploading an image that is 480x768 px. The file must be smaller than 5MB and not exceed 5000 px on either height or width. Check out this awesome mockup of a smiling white baby sitting on his crib while wearing a onesie! Is a great option for you to showcase your latest onesie designs! All you need to do is drag-and-drop your image file on the interface, we will process it for you in just seconds! Try another Onesie Mockup here! Check out this cute onesie mockup featuring a little baby girl making funny faces while sitting on a black leather sofa! It's awesome to showcase your latest baby designs in a cute and innovative way. It's easy to use and doesn't require any additional software. Try it out, it's fun and cute! 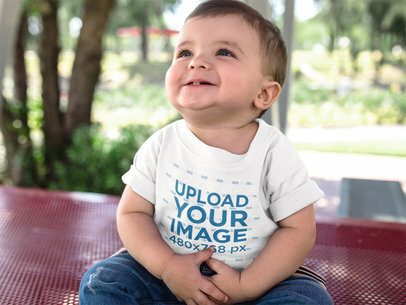 Check out this awesome mockup featuring a baby looking up while smiling, he's wearing a round neck tee while sitting down outdoors. This image is a beautiful option if you are looking to promote your latest design in a real-life environment. 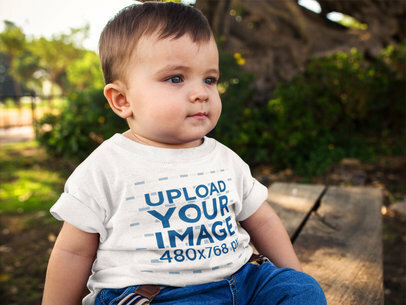 Use this mockup and show a photorealistic version of your kids round neck tee design. Amazing, right? Try another T-Shirt Mockup! For best results, we recommend uploading an image that is 480x768 px. The file must be smaller than 5MB and not exceed 5000 px on either height or width. 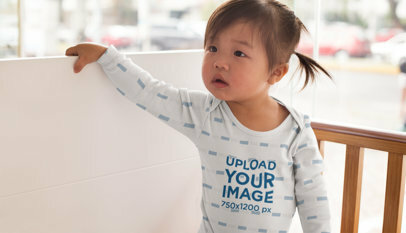 Take a look at this awesome mockup of a baby boy on his baby sit wearing a onesie! It's an awesome mockup for you to showcase your latest onesie designs for babies! Just drag-and-drop your image design here, we will have it processed for you in just seconds! Try another Onesie Mockup here! 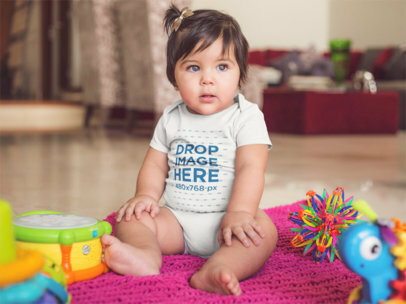 This onesie mockup of a little baby girl dancing while sitting down on her carpet near her teddies is a beautiful mockup to display your latest babies' design! You just have to drag-and-drop your image design on the interface, we will process it for you in just seconds! 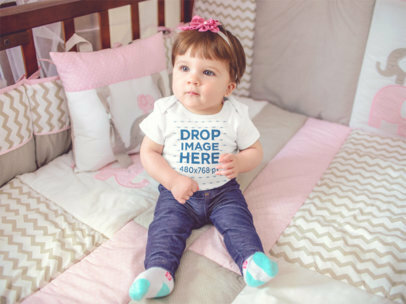 What better to show your cute designs than this beautiful little baby girl's onesie? Try another Onesie Mockup here! 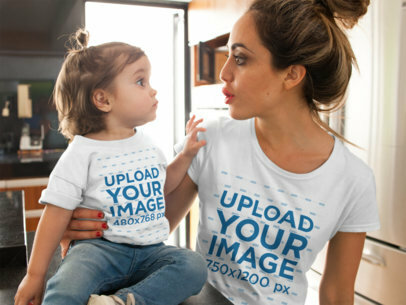 Check out this awesome mockup featuring a mom and daughter wearing different tshirts while talking, this image is a great choice for you to build a stronger image marketing. Start now! The menu on the right will let you choose the tshirts colors, then upload a design for each tee with the menu on the left. It's super easy! Start using Placeit and make your revenue grow! Try another T-Shirt Mockup! Wondering how to sell your onesie designs in the cutest way? Drag and drop the image file into this mockup image of a very happy baby girl sitting down on her playing room while wearing a onesie, and get your designs an extra touch of cuteness! Try another Onesie Mockup here! Looking for a way to promote onesies? A cute template of a baby like this is great for you to showcase your cutest designs! You can choose a color and put your image on it, the only thing you need to do is drag-and-drop the design file on the interface so we can merge it for you. That's right, and it'll only take a few seconds! Try another Onesie Mockup here! Check out this awesome mockup featuring a little baby girl going down some stairs with her mom, it's a beautiful image that you can use to promote your latest design for kids in a friendly way. Start now! 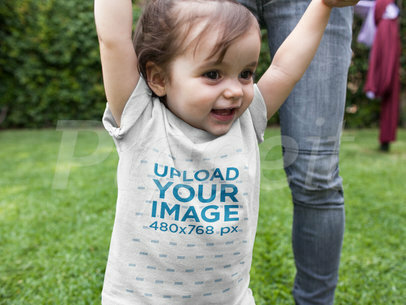 Put your design on a gorgeous mockup by Placeit and make your revenue grow by showing your kids t-shirt design on a beautiful visual. Take a look at this awesome template by Placeit! 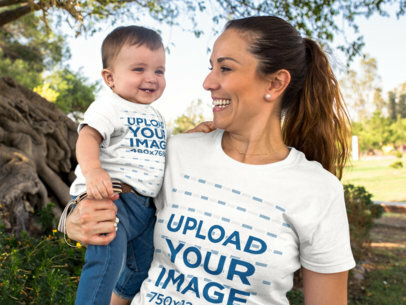 It's featuring a mom and son smiling while wearing different round neck tees, it's a perfect image if you are looking to promote different parents and kids designs in one gorgeous image. Use it now! Placeit has tons of different images you should use to promote your latest apparel designs. Try another T-Shirt Mockup! For best results, we recommend uploading an image that is 480x478 px. The file must be smaller than 5MB and not exceed 5000 px on either height or width. Were you looking for an amazing way to showcase your latest baby onesie design? 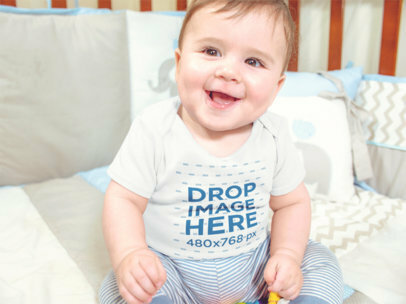 Use this mockup of a happy baby smiling while sitting down and wearing a onesie and create engagement in your customers! All you need to do is drag-and-drop your image design on the interface, we will process it in only seconds! Try another Onesie Mockup here! 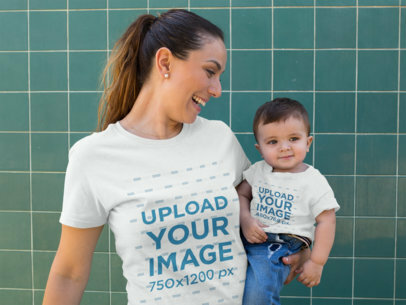 Take a look at this beautiful mockup featuring a mom and son wearing different round neck t-shirts while against a green tiles wall, it's a perfect choice if you are looking to promote your latest parents with kids designs to your audience in a photorealistic and beautiful way. Promote your t-shirt designs with gorgeous mockups from Placeit and watch your income grow. For best results, we recommend uploading an image that is 480x768 px. The file must be smaller than 5MB and not exceed 5000 px on either height or width. Were you looking for the most awesome way to showcase your latest onesie designs? All you need to do is drag-and-drop your image design on the interface, we will merge it in just seconds with this beautiful image! Using this mockup of a little white baby clapping and sitting down with a big monkey plush in the background is a perfect way to make your customers engage with your brand! Try another Onesie Mockup here! Take a look at this mockup from Placeit! 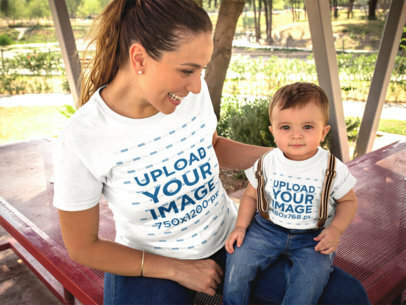 Featuring a mom and baby boy wearing t-shirts while outdoors, it's a perfect choice if you are looking to promote two cool designs in one image. Start now! 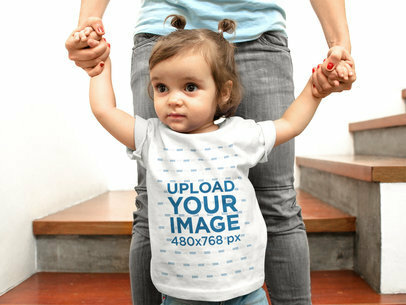 This mockup is perfect for promoting your designs to parents with kids. 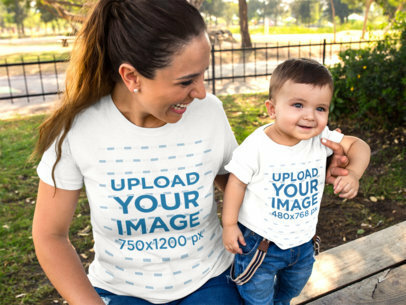 Take a look at this beautiful mockup featuring a mom and son wearing different t-shirts while at the park, it's a great choice if you are looking to promote your parents with kids designs in a photorealistic way. All the parents' eyes will be on your brand! Start now! It's amazingly easy and no additional software is required. Check out this awesome template of a little baby boy by Placeit! It's featuring him wearing big sunglasses and a round neck tee while alongside his mom, she's also wearing a round neck tee. Use this mom and son image to promote your latest designs in a beautiful and visually appealing way. Start now! Choose a color for each tee with the menu on the right, then upload your designs with the menu on the left. Easy, right? Try another T-Shirt Mockup! Take a look at this beautiful mockup from Placeit! It features a mother and her baby boy wearing t-shirts at the park, they're so happy! Choose the color for each tee using the menu to the right side of the page, then upload a design of yours for each tee. Awesome, isn't it? Use Placeit and make your revenue grow! For best results, we recommend uploading an image that is 480x768 px. The file must be smaller than 5MB and not exceed 5000 px on either height or width. If you were looking for an awesome manner to showcase your latest onesie design for babies, this mockup of a pretty baby boy playing with toys wearing a onesie while on his knees at his playground is the smartest choice for you! All you need to do is drag-and-drop your image design on the interface, we will process it in just seconds! Try another Onesie Mockup here! Check out this mockup from Placeit! Featuring a mom and her baby girl walking at a park while wearing a t-shirt, it's a perfect visual that you can use to promote your latest design in a visually appealing way. Start now! This mockups is easy to use and works great for you to start promoting towards parents with kids t-shirt designs. 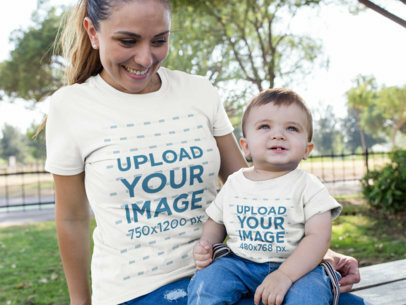 Take a look at this mockup featuring a mom and her baby wearing different round neck tees while outdoors, it's a beautiful visual that you can use if you are looking to promote your latest design in a creative and beautiful way. Start now! The menu on the right will let you choose a tshirt color, then upload your designs with the menu on the left. Amazing, right? Try another T-Shirt Mockup! 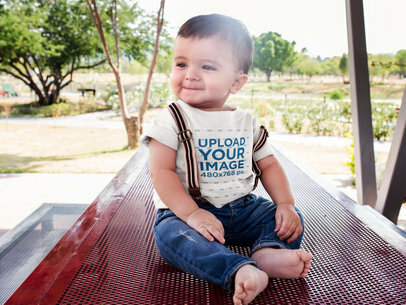 Check out this awesome mockup of a baby boy looking down to the floor while sitting down on a bench outdoors wearing a round neck tshirt, it's a beautiful visual for you to showcase your latest design to your audience! 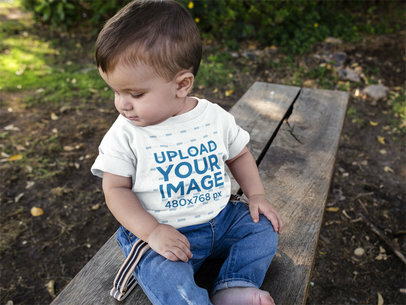 Start using Placeit now and make your revenue grow with gorgeous images that will help you sell more kids t-shirts. Awesome, right? Try another T-Shirt Mockup! For best results, we recommend uploading an image that is 480x768 px. The file must be smaller than 5MB and not exceed 5000 px on either height or width. 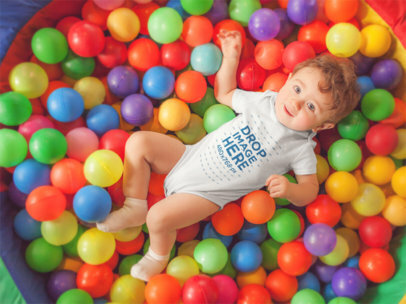 Check out this onesie mockup of a pretty baby having fun at a ball pit! It's an awesome and fun way to showcase your latest onesie design. All you need to do is drag-and-drop your latest designs in the interface, we will publish them for you in just seconds! All it will take is a few seconds! Try another Onesie Mockup here! 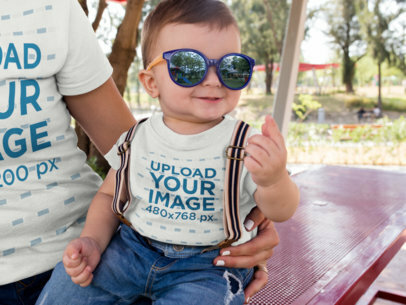 Check out this awesome mockup featuring a little baby boy wearing a round neck tee while sitting down outdoors, this image is the best choice if you are looking to promote a cute design to your audience. Start now! All you have to do is use the menu on the right to choose the tshirt color, then upload a design with the menu on the left. Try another T-Shirt Mockup! For best results, we recommend uploading an image that is 480x768 px. The file must be smaller than 5MB and not exceed 5000 px on either height or width. Use this awesome mockup of a white baby wearing a onesie and smiling while playing in the ball pit! If you want to showcase your latest onesie designs in an engaging way, this mockup is just for you! All you need to do is drag and drop your image file here. We will merge it in just seconds just for you! Isn't it great? Try another Onesie Mockup here! Check out this awesome mockup featuring a little girl walking with her mom while wearing a round neck tee in the park, this image is beautiful if you are looking to promote a design in a photorealistic manner. Start now! The menu to the right side of the page will let you choose the tshirt color, then upload a design and remove its black or white background using the menu to the right. Amazing, right? Try another T-Shirt Mockup! 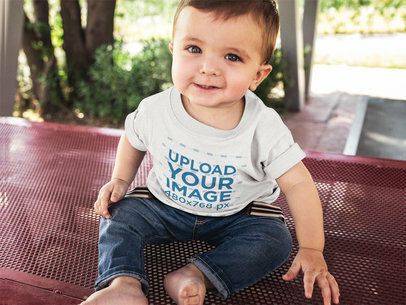 Check out this awesome template featuring a little baby looking to the camera while wearing a round neck t-shirt, he's sitting down on a red table! All you have to do is just use the HEX tool to the right to choose a tshirt color, then upload a design of your own with the menu on the left. Start using Placeit now and make your income grow! Try another T-Shirt Mockup! 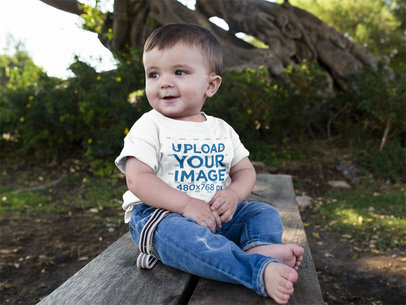 Take a look at this beautiful template of a cute baby boy sitting down on a wooden bench while wearing a round neck tshirt, it's a perfect choice if you are looking to promote your latest design in a gorgeous way! This image is just stunning, use it now! The menu to the right will let you choose a tshirt color. Use Placeit and make your income grow! Try another T-Shirt Mockup! For best results, we recommend uploading an image that is 480x768 px. The file must be smaller than 5MB and not exceed 5000 px on either height or width. Only cute design are allowed in this mockup! If you were looking for a beautiful option to showcase your latest onesie design, Placeit has brought you the solution! Show your customers how your design will look like on their baby by placing your image design on this interface. That's all, just wait a few seconds and we'll have it merged for you! This beautiful baby sitting in her crib while wearing a onesie is an excellently made mockup. Try another Onesie Mockup here! Check out this mockup of a happy baby wearing a round neck tshirt and sustainers while sitting down on a red table. Showcase your latest design in a realistic way with this amazing image of a baby sitting by himself on a red metal table at a park. Use now Placeit's mockups and show your designs with the best images on the market. Awesome, right? Try another T-Shirt Mockup!